Choir – The St. Joseph Choir sings Sundays at 11 AM Mass, leading the singing and offering an anthem. Practice is held on Thursday evenings at 6:30 PM in the Church. New members are welcome! Choir season starts in October and continues through Pentecost. Cantors – These individuals lead the singing at parish liturgies. Cantors are selected through an audition process. 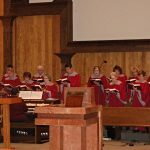 Contemporary Group – This musical group plays once a month at alternating liturgies. The music is more upbeat and contemporary. New voices are welcome. See Roy after any Mass for information.